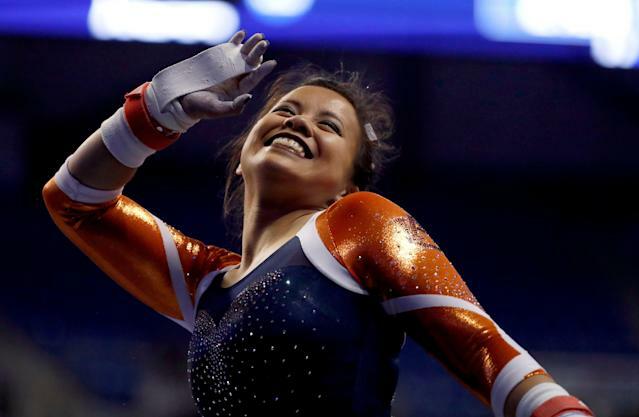 Auburn gymnast Samantha Cerio’s horrific accident during her final competition catapulted her to reluctant viral fame, but she’s ready to move on from gymnastics and start the rest of her life. Cerio dislocated both of her knees and tore multiple ligaments while landing a handspring double front at a regional competition last week, and a video of the landing went viral. But Cerio isn’t the type of woman to let any of that get in her way. She gave her first interview since the accident to “Today” on Monday, and she continued to have an unfailingly positive attitude about what’s happened to her. For Cerio, the routine she started on that fateful day was just another routine. She had no premonition that anything would happen, and everything was normal — even her pre-routine jitters. As she was doing that tumbling pass, she felt that something was slightly off, but she’d always been able to “pull it back” in the past. And even when she landed, she didn’t immediately know anything was wrong. She didn’t start to feel any pain until she looked down and saw what had happened. Cerio credits her family, friends, teammates, and coaching staff for helping her maintain a positive attitude. Cerio also addressed the video of her gruesome accident going viral. She tweeted last week that “my pain is not your entertainment,” and she believes that by doing that, she’s made others more aware of the real people behind tragic viral videos. Cerio’s gymnastics career is over, but as a college senior just months from graduation, she’s about to embark on the next chapter of her life. She’s getting married soon, and she’ll be putting her degree in aerospace engineering to good use as a structural design analysis engineer working on rockets with Boeing. Her time as a college gymnast may not have ended the way she dreamed, but a bright future is waiting for her.